It’s time to admit it — summer is nearly over. Though I’m not-so-secretly excited to give summer a bitchy wave (buh-bye!) and embrace fall with open, sweater-clad arms…I am a bit resistant to let go of the sun-kissed glow that the season leaves behind on my typically pale, freckle-flecked complexion. Yes, the transition is upon us, friends and if you’re anything like me, you don’t mind stretching that glow just a bit longer. Here are the products I love to bring out as I think about packing up those sundresses. 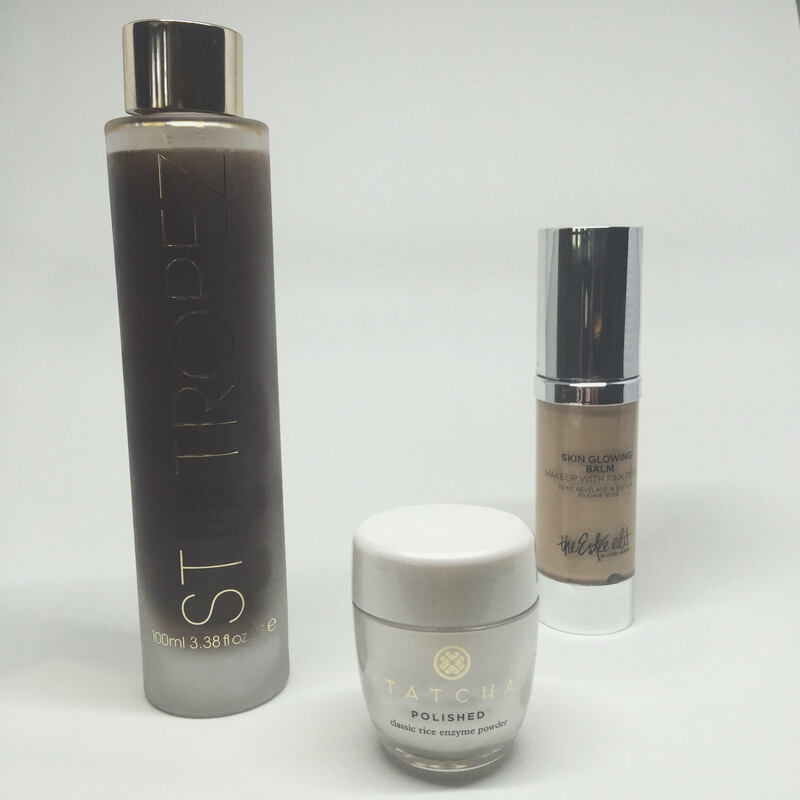 St. Tropez Luxe Dry Oil is an enigma. Is it a self-tanner? Is it a moisturizer? Is it an illuminator? It’s all three and if it hasn’t already been your bff all summer long (because we all know fake bake is best–plus, who has time to lounge leisurely in the sun anyway?) start getting acquainted in these last few weeks of sunshine. It will extend the life of your tan, while re-conditioning your skin from months of abuse. Plus, it gives limbs the prettiest subtle sheen. Made from Rice Bran, Papaya and Pearl extract, TATCHA Polished Rice Enzyme Powder is the most gentle exfoliator I’ve ever tried. It leaves my dry skin radiant and soft without scrubbing it raw. I’m hooked. Peonies are my favorite flower and Skin Glowing Balm by The Estee Edit is my new favorite tinted moisturizer. It’s full of super moisturizing goodies like Primrose Oil and Shea Butter, as well as soothing Pink Peony extract. I tend to gravitate toward tinted moisturizers over heavy foundation because I don’t like to cover up the freckles on my face–seriously, I wind up looking like I’m wearing the mask from Saw. This one comes in 12 shades for almost all skin colors, blends seamlessly and feels amazing on the skin in any season. Spill. What are your go-to products as summer winds down?